My holiday reading list included Flourish… A Visionary New Understanding of Happiness and Well- being by Martin E.P. Seligman. I have written in earlier blogs about my work with optimism and had read Seligman’s earlier book, Learned Optimism: How to Change Your Mind and Your Life. I found that the behaviors of optimists that had positive effects on our lives could be consciously practiced. 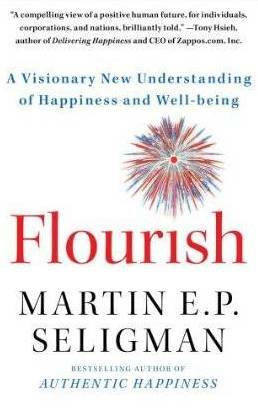 In Flourish, Seligman describes positive psychology and expands a theory of happiness to an understanding of well-being that allows one to flourish. He applies his work to life, health, education, economics and policy development and includes a section on teaching well-being in schools. I found that as I read, my applications of the content continually jumped to many areas of my life and work. Positive Emotions…a pleasant life. Seligman discusses the need for an appropriate ratio of positive to negative comments. From corporate meetings to marriage relationships the positive to negative ratio in conversations is a predictor of success. That’s why I have always used a planning process for coaching conversations that allows the coach to build a positive emotional tone. Approval statements and questions around strengths of the teacher or the lesson open the door for a teacher to be vulnerable and explore an area for growth or change. I remember being asked by an observer how I found so many positives to build into the conversation. I said it was simple. I spent most of my observation time and focus looking for them. Often areas for improvement are the easiest things to spot. Once you havefound an area for improvement, focus the observations on positives to work from. Engagement…..Did time stop for you? Were you completely absorbed by the task? These are the questions that are used to identify a state of flow, an element of well-being. For coaching to have its desired impact on student outcomes coaches need to build teacher engagement in teaching and learning. A teacher’s critical and creative thinking in a coaching pre-conference can set the stage for teacher engagement in the teaching/learning activity, the follow up post conference and the next step outcome. Questioning is a critical coaching skill. I have always had exploration of teachers’ beliefs as a component of coaching training and conferencing design. Prescribed and sequenced curriculums focused on testing schedules have often hidden meaning for teachers and students. Effective coaches have teachers explore and identify meaning of their work and decisions. Accomplishment and Achievement were identified as elements of well-being. This suggests that goal setting in coaching can increase teachers’ sense of well-being. What are the signs of success that will indicate progress toward and achievement of the desired results of the teacher’s efforts? One of the observing roles of a coach is to spot early signs of success and bring them to the teacher’s attention. While looking at the coaches’ role of building positive relationships with teachers has always been part of my training sessions, I have increasingly seen the coach’s role as one of building staff to staff relationships. Teaching is a team sport. Teacher well-being and student well-being are increased as positive relationship grow. The great news is that coaching well-being will likely increase your well-being.